On this page, you will find a list of changes between Normal/Heroic modes and Mythic mode, as well as a working strategy to defeat Elerethe Renferal in The Emerald Nightmare in Mythic mode. On Mythic difficulty, Elerethe will gain multiple new abilities, as well as large increases to her health and damage output. Elerethe uses an additional ability depending on what platform she is currently on. On the first platform she uses Tangled Webs, on the second she uses Violent Winds, and on the third Nightmare Spawn. Pain Lash modifies Web of Pain. It will cause any players that collide with the beam that links the players targeted by Web of Pain to take a large amount of Nature damage, and be knocked back a fair distance. In Mythic mode, Web of Pain is cast on two tanks and two non-tanks every time. Tangled Webs (only used on the first platform) happens immediately after Elerethe jumps down from her web during Feeding Time. It summons a really large web at her location. If raid members remain standing on it for more than 2 seconds, it will spawn Venomous Spiderlings. Then the web shrink slowly (disappearing a bit after the second Feeding Time is cast). Nightmare Spawn (only used on the third platform) causes egg sacs to continuously grow over time. Fully grown egg sacs release Venomous Spiderlings when run over. Elerethe will pop all grown egg sacs during Vile Ambush. On Mythic difficulty, you no longer have the option of stacking the Spiderlings with Elerethe when tanking them, this is because of Swarm. For each Spiderling that is within rage of Elerethe, she will gain a 25% increase to damage dealt, and 25% attack speed. This ability stacks indefinitely, and will continue to empower the boss per each Spiderling in her range. In her Roc Form, Elerethe uses Violent Winds twice. This knocks back any player in front of her, and deal increasingly deadly Shadow damage every second for 8 seconds. Players hit by Violent Winds receive stacks of Wind Burn, which increases the damage they take from Violent Winds by 12% per stack. This debuff drops after 45 seconds. The strength of the pushback, and the speed at which Wind Burn is applied is reduced by the number of players that are hit by this ability. 20 stacks of Wind Burn are distributed with every tick of Violent Winds. Every player standing in front of the boss receives 1 stack, except for the tank who receives the rest. For example, if 5 players plus the tank stand in front of the boss, they each receive 1 stack, except for the tank who gets 15. Web of Pain is not very dangerous, just annoying. 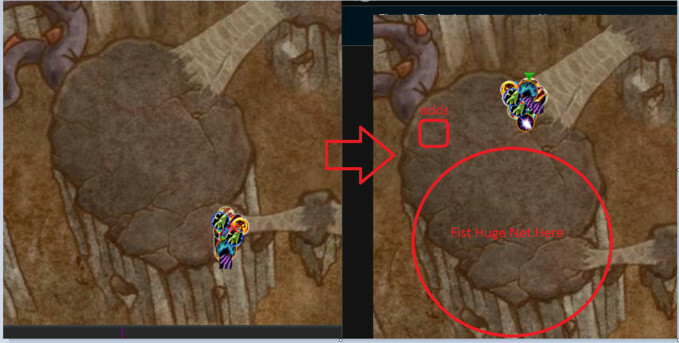 Afflicted Raid members need to make sure to position themselves somewhere where they will not unnecessarily knock people back (like on the side of the boss or outside of the raid). The idea is to position the boss in a corner of the platform and run away to the other side once the location for Vile Ambush has been designated. The goal is to spawn no Spiderling from the web. Spiderlings need to be tanked and killed a bit away from the tank, because of Swarm. On the third platform, this (together with Nightmare Spawn) will cause a massive Dripping Fangs building on the Spiderlings tank after Vile Ambush. On the second platform, you can have one tank solo-handle the first Violent Winds and the other tank solo-handle the second. Pro-active tanking cooldowns will be needed and a few players can stand in front of the boss to help soak, if necessary. A Protection Paladin can completely negate the adverse effects of Violent Winds by using Divine Shield on the first cast and Blessing of Spellwarding on the second. 04 Oct. 2016: Added Mythic strategy after discussing with pottm.